Bush | Something should go here, maybe later. Ran into this the other day, apparently written by an economist who used to work with Bush Jr. It contradicts (I’m tempted to say busts but it’s one guy’s word) very comprehensively the image of Bush as stupid. The new George W. Bush Presidential Center is being dedicated this week. This seems like a good time to bust a longstanding myth about our former President, my former boss. The class went dead silent. Everyone knew that this was the true meaning of the question. Kudos to that student for asking the hard question and for framing it so politely. I had stripped away that decorum and exposed the raw nerve. I could tell they were waiting for me to break the tension, laugh, and admit I was joking. I did not. A few shifted in their seats, then I launched into a longer answer. While it was a while ago, here is an amalgam of that answer and others I have given in similar contexts. I am not kidding. You are quite an intelligent group. Don’t take it personally, but President Bush is smarter than almost every one of you. Were he a student here today, he would consistently get “HP” (High Pass) grades without having to work hard, and he’d get an “H” (High, the top grade) in any class where he wanted to put in the effort. For more than six years it was my job to help educate President Bush about complex economic policy issues and to get decisions from him on impossibly hard policy choices. In meetings and in the briefing materials we gave him in advance we covered issues in far more depth than I have been discussing with you this quarter because we needed to do so for him to make decisions. President Bush is extremely smart by any traditional standard. He’s highly analytical and was incredibly quick to be able to discern the core question he needed to answer. It was occasionally a little embarrassing when he would jump ahead of one of his Cabinet secretaries in a policy discussion and the advisor would struggle to catch up. He would sometimes force us to accelerate through policy presentations because he so quickly grasped what we were presenting. I use words like briefing and presentation to describe our policy meetings with him, but those are inaccurate. Every meeting was a dialogue, and you had to be ready at all times to be grilled by him and to defend both your analysis and your recommendation. That was scary. We treat Presidential speeches as if they are written by speechwriters, then handed to the President for delivery. If I could show you one experience from my time working for President Bush, it would be an editing session in the Oval with him and his speechwriters. You think that me cold-calling you is nerve-wracking? Try defending a sentence you inserted into a draft speech, with President Bush pouncing on the slightest weakness in your argument or your word choice. In addition to his analytical speed, what most impressed me were his memory and his substantive breadth. We would sometimes have to brief him on an issue that we had last discussed with him weeks or even months before. He would remember small facts and arguments from the prior briefing and get impatient with us when we were rehashing things we had told him long ago. And while my job involved juggling a lot of balls, I only had to worry about economic issues. In addition to all of those, at any given point in time he was making enormous decisions on Iraq and Afghanistan, on hunting al Qaeda and keeping America safe. He was making choices not just on taxes and spending and trade and energy and climate and health care and agriculture and Social Security and Medicare, but also on education and immigration, on crime and justice issues, on environmental policy and social policy and politics. Being able to handle such substantive breadth and depth, on such huge decisions, in parallel, requires not just enormous strength of character but tremendous intellectual power. President Bush has both. While I don’t think being able to predict advisers answers is necessarily always hard, it is pretty funny. 1) He’s from Texas, not from the “intelligent” states (and as a result has a “funny” accent”. 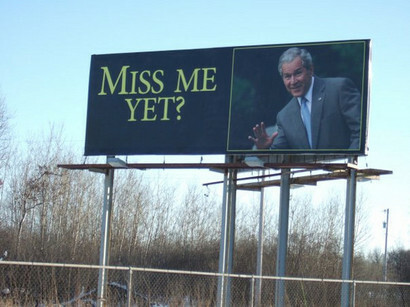 No Right Turn reports that George Bush has been found guilty of war crimes. What Idiot doesn’t mention is that the fake verdict has been completely overturned on fake appeal. My wife just handed down the decision about 5 minutes ago. Worse, the fake motion to go to fake supreme court has been denied. Update: From the Russel Tribunal article linked above. A very interesting article about Bush, and his MBA. First, the fact that Bush actually had to work to get his degree. The comparatively small amount of attention paid by the political press to the President’s Harvard MBA partially reflects a generalized ignorance of, and hostility toward, the degree itself. More importantly, acknowledging that he learned any valuable intellectual perspectives would contradict the storyline that young W was a party animal, who coasted through his elite education, scarcely cracking a book. In other words, as the left never tires of claiming, he is too ‘stupid’ to have picked up any tricks across the Charles River from Harvard Square. This is patently incorrect. Having attended Harvard Business School at the same time as the President, graduating from the two—year program a year after he did, and then serving on its faculty after a year’s interval spent writing a PhD thesis, I am intimately familiar with the rigors of the program at the time, and the minuscule degree of slack cut for even the most well—connected students, when their performance did not make the grade. There is simply no way on earth that the son of the then—Ambassador to China (technically, head of the Beijing Liaison Office), or anyone else, could have coasted through Harvard Business School with a ‘gentleman’s C.’ I never, ever heard of a case of an incompetent student being allowed to graduate, simply because a certain family was prominent. On the contrary, I did hear stories of well—born students having to leave prior to graduation. The academic standards were a point of considerable pride. … The screen was a vital component of the HBS quality assurance program, itself an essential method of protecting the value of the school’s MBA ‘brand.’ Harvard Business School would no sooner voluntarily graduate an incompetent MBA holder than Coca Cola would ship—out bottles containing dead mice. Then, there is what the president would have learned. The very first lesson drummed—into new students, as they file into the classrooms of Aldrich Hall, is that management consists of decision—making under conditions of uncertainty. There is never perfect information, and decisions often have to be made even when you’d really prefer to know a lot more. Given this reality, students are taught many techniques for analyzing the data which is available, extracting the non—obvious facets, learning how read into it the reasonable inferences which can be made, while quantifying the risks of doing so, and learning the costs and value of obtaining additional data. The job of the executive is to weigh probabilities in evaluating imperfect information; to assess the costs and benefits of acting or not acting; and to construct scenarios around the various possible time frames for taking action, taking into account the probable reactions of the other vital actors. That political opponents at home carp at him over his imperfect data at the time is no surprise, and no reason to regret his decision. The costs of not acting were simply too great, and the downside potential of erroneous information too low to prefer inaction. Better data would have been preferable, of course, but President Bush shows no sign of remorse for doing what he knows was the prudent thing under the circumstances. 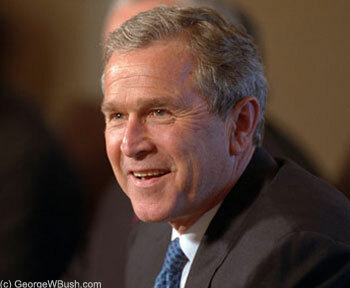 Bush was famous for taking in all available recommendations then making his decision – quickly. Obama on the other hand, agonised for months on his Afghanistan strategy while the military was left in limbo. Then there’s negotiation – something that Obama is doing very poorly at. One final note on George W. Bush’s management style and his Harvard Business School background does not derive from the classroom, per se. One feature of life there is that a subculture of poker players exists. Poker is a natural fit with the inclinations, talents, and skills of many future entrepreneurs. A close reading of the odds, combined with the ability to out—psych the opposition, leads to capital accumulation in many fields, aside from the poker table. By reputation, the President was a very avid and skillful poker player when he was an MBA student. One of the secrets of a successful poker player is to encourage your opponent to bet a lot of chips on a losing hand. This is a pattern of behavior one sees repeatedly in George W. Bush’s political career. He is not one to loudly proclaim his strengths at the beginning of a campaign. Instead, he bides his time, does not respond forcefully, a least at first, to critiques from his enemies, no matter how loud and annoying they get. If anything, this apparent passivity only goads them into making their case more emphatically. That was written before the 2004 election. On Katrina, Bush said he didn’t land Air Force One to view the submerged New Orleans up close because he was worried about taking resources away from rescue efforts. Fact is, had he landed that’s the criticism that he would have faced. It was a dammed if you do, dammed if you don’t situation, and I personally believe he did the right thing. After the Bush years, many of us woldn’t have ever though the left would try to claim the moral high ground again. But they have. So New Zeal has a no-holds-barred reminder of the ugly obscenity-filled hate speech that was was oh-so-common through those years. But let’s be clear. There is no doubt that both the left and the right have extremists. Personally, I believe that BDS fostered and encouraged by democrats in congress* demonstrated the left is worse, but I can respect the middle view that both are as bad as each other. My point is merely that the claims by the left that this is only a feature of the right, are flagrantly false. *For example, by claiming that Bush manipulated intelligence so he alone in the world got the “correct” reports that told him there were no WMD in Iraq. A nice, direct message from the Republican Party. …and the Telegraph chooses to swim against the current. Much of the condemnation of his policies though is driven by a venomous hatred of Bush’s personality and leadership style, rather than an objective assessment of his achievements. Ten or twenty years from now, historians will view Bush’s actions on the world stage in a more favourable light. America’s 43rd president did after all directly liberate more people (over 60 million) from tyranny than any leader since Winston Churchill and Franklin D. Roosevelt. Widely seen as his biggest foreign policy error, the decision to invade Iraq could ultimately prove to have been a masterstroke. Today the world is witnessing the birth of the first truly democratic state in the Middle East outside of Israel. Over eight million voted in Iraq’s parliamentary elections in 2005, and the region’s first free Muslim society may become a reality. Iraq might not be Turkey, but it is a powerful demonstration that freedom can flourish in the embers of the most brutal and barbaric of dictatorships. The success of the surge in Iraq will go down in history as a turning point in the war against al-Qaeda. The stunning defeat of the insurgency was a major blow both militarily and psychologically for the terror network. The West’s most feared enemy suffered thousands of losses in Iraq, including many of their most senior commanders, such as Abu Musab al-Zarqawi and Abu Qaswarah. It was the most successful counter-insurgency operation anywhere in the world since the British victory in Malaya in 1960. I’d add that it is with tremendous grace that George Bush has accepted his designated role as villain, fall guy, punching bag, even as president-elect Barack Obama picks up where Bush is leaving off. Maybe someday they’ll look back at that small footnote, Bush’s magnanimous handling of the not-so-friendly fire, as another sign of his great statesmanship. Much as Lincoln, revealed as an “ape” by lesser pols and small opinionmongers in his time, is today the statesman, commander in chief and champion of freedom everyone wants to be compared to. Though I have to smile at this witty comment on the Telegraph site. Excellent article. The only bit I disagree with is the first word, the last word, and everything in between. Actually, reading through some of the comments there are remarkably few BDS sufferers featured. One of the readers didn’t notice the trend however, and predicted that in a few years Bush’s only fans would be those he pardoned. I guess Saddam won’t feature then. Speaking of which, those predictions of mass “midnight” pardoning never did eventuate, did they? Funny how that got so much airplay. Yet Obama has already played more Golf as president than Bush did in his entire 8 years. Just shows you how perceptions can differ so much from reality, and how those perceptions can change reality, since Bush actually gave up golf lest the media report that he was out playing while solders were dying. Obama v Bush – Who to kill? Well, for those that follow the comments round here I’ve had a difference of opinion with someone. He thinks that it’s absurd to suggest that Bush was treated far worse than Obama, I think the reverse is absurd. So I did some google searches. “Kill Bush” gives 37,300,000 results. “Kill Obama” gives 56,300,000 results. So quite a few more for Obama… But then I realised there was something else – what the searches returned. So there you have it, some idiot put a single poll on Facebook, and the entire MSM and left of the blogosphere and much of the right wrote to condemn it. There are also some plots to kill him by various crazy people, and various crazy people convinced that he’s going to be killed. Obama had a poll on Facebook by some idiot that was taken down in hours. Nobel Prize wanted to kill Bush, and the top search is a game which is still up over a year later with comments like “nice game i hate gearge bush”. “Absurd” doesn’t even begin to describe the situation. I pity the Secret Service. Ah, memories of the past. It seems like just yesterday that, instead of the fringe right obsessing over Obama’s birth certificate, we had the fringe (well, they didn’t seem to think so) left obsessing over Cheney’s vice-like grip over Bush. According to the author of the Post piece, Barton Gellman, who earlier wrote a book on Cheney called “Angler,” the former vice president believes Bush made concessions to public sentiment, something Cheney views as moral weakness. After years of praising Bush as a man of resolve, Cheney now intimates that the former president turned out to be more like an ordinary politician in the end, Gellman says. “In the second term, he felt Bush was moving away from him,” Gellman quoted a participant in the recent gathering, describing Cheney’s reply. So it turns out that Bush wasn’t captured by Cheney after all – at least not in the later days of the administration. 1. No, wait. This is actually part of Cheney’s diabolical plan! I see it all, can’t you? Add your own in comments.